Um ... we've just got to continue and continue? The debunking handbook seems good to me. It has taught me not to urge listeners not to think of a white bear. I now cringe when I find people trying to promote things they believe in, and starting with the well-financed lies they are trying to refute. One of the biggest barriers to making progress in these converstaions is our desperate desire to make progress. By trying to move the conversation on we often end up effectively conceding ground that shouldn't have been conceded. Perhaps what is needed is a period when we accept that little progress is going to be made and instead take time to hold people to account for their views and opinions. There is an example of this at WottsUpWithThatBlog, where 'Scottish Sceptic', Mike Haseler, is being pushed to justify his stance on one issue and people keep coming back to this and refusing to move on. In the end I suspect he will claim some form of victimisation and remove himself from the conversation (Pielke Sn. was involved in a similar discussion there but dug his escape tunnel early), so it is important then, if this does happen, that other conversations involving him refer back to that one. I don't think we should be engaging with someone who refuses to defend or concede their arguments. Perhaps what is needed is a database of people involved in these discussions where their failures to acknowledge errors, and conversely their concessions, for example Nafeez Ahmed's retraction, can be logged. For those who want to delay, going round in circles is a win. Dropping out of conversations whilst creating a sense of legitimacy about this withdrawal is also a win. The only way I can see of moving forwards is to meticulously document the lack of good faith involved in these discussions and find a way of demonstrating this to those who have only a superficial view of the debate. Re. progress and what's stopping it: a link via Desdemona at the bottom of here just caught my eye: the Boston Globe's take on Willie Soon. It gives a striking image of the manufactured turmoil occurring in Washington, and suggests just how easy it is to reverse engineer how that manufacture process takes place. It's a fascinating twist to think that it could be happening purely near particular centres of power, with the general public only targeted to the extent that they feed into that via voting. Someone, somewhere, has made a map of Washington lobbyists, surely? One that can switch between physical/process/money maps? On the other hand, I've been having a rather odd week listening to some people who, in theory, accept the science of climate change but have bought a truckload of political assumptions with them. I never used to think this was a problem: so, some left-leaning people accept the science, perhaps for non-scientific reasons? So what? Now I'm not so sure. A recent example from Naomi Klein that kind-of captures what I mean - actually citing Tyndall Centre scientists too, arguing for degrowth as the only effective response. I have no problem with scientists having views on what should be done, but I am worried about lazily assuming climate change just happens to support your political view. Right-wing laziness is its mirror: reject the science rather than think about political solutions that would work. I suppose this is just a variant of the hairshirts vs techno-utopians thing, but... well, not really. That's the thing I like about the price system: me getting to decide I'm OK with my 5p-an-hour watt-guzzling eternal adolescence and someone else being OK with their stupid 20 foot high truck with wheels the size of small cars. There's a bigger question there about distribution of wealth - but that's emphatically NOT a climate change question, despite what anyone may argue. Urgh. Leftie guardianista arguing for more space for right-wing ideas in climate discussion. How about a "kickstarter projects" thread, or other call for comments, for highlighting projects worth considering supporting, or for suggesting potential kickstarter projects that someone else could do? I like it too, but have some issues. It's an asymmetrical problem, as the industry part is entirely without scruple, and does not yield to evidence. Kind of like arguing with a two-year-old, or a mental deficient. Proof doesn't work and results in repetition. No smoke without fire, and all that. I also am more concerned about our current trend of consumption. I don't think infinite expansion works. I don't draw a line between global warming and greenhouse gases and other kinds of pollution. It spills over into the cultural arena as well. History will tell you that acquisition can be blind to the suffering of its victims, but that has rarely stopped anyone. What stops them is collapse, and we've seen it over and over; it takes us all down, not just the proponents of excess. Your hypothetical monster truck would be OK in the singular, but our global media-fed trend towards consumption and excess (note the trends in cleaning products and the dangers of excessive use of antibacterial soap and disposable cleaning materials, as one small example) is taking the place of free and pleasurable pursuits. You have done your homework and I'm just reacting, so to be fair I would have to concede, but I think there's a lot more to the problem and this is only one way of looking at it. I still want a future where, if someone happens to want to spend all their money on some awful gas guzzling monster that I hate because I’m a tofu-knitting Guardianista, they’re fecking allowed to. This feels a little strawmanny to me. Is there anyone who seriously argues this behaviour should be banned? They should certainly pay for it, isn't that what a carbon tax would do, essentially? We probably can have a high-energy future, but it's going to be expensive. Much more expensive. Anyone who wants to keep living a high consumption lifestyle needs to accept the costs of doing so if they want their views to be taken seriously, don't they? O Patrick: "This feels a little strawmanny to me. Is there anyone who seriously argues this behaviour should be banned? They should certainly pay for it, isn’t that what a carbon tax would do, essentially?" That's exactly what a carbon tax would do, yes - and maybe it's not the same where you are , but in the UK, in many of the climate-active groups, most maybe don't argue huge trucks should be banned (though some would), but they argue that crass consumerism is the key problem. It's connected to a consistent worldview where a hegemonic capitalism keeps everyone in false consciousness. 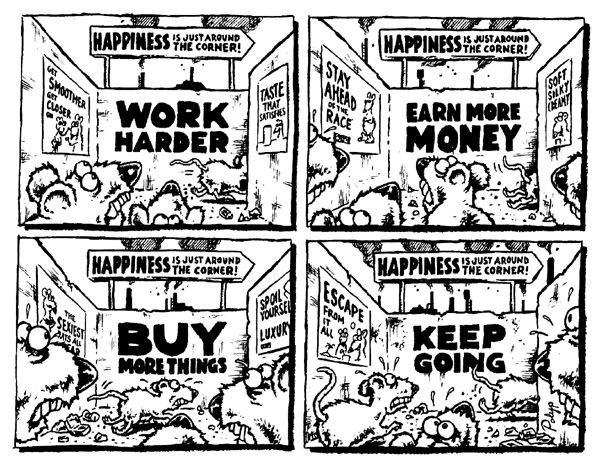 The book enough is enough (arguing for a steady state economy) is an exemplar of that, interspersed with cartoons like this one by Polyp. A carbon tax (or other effective price-based constraining framework) takes care of that - or would if it worked, and maybe we want to argue that it's impossible for it to be effective at this point. I'm not 100% sure of my own motivation for ranting about it, and overall maybe I am being straw-person-ish. The majority of people actively doing something about climate are aware that the climate issue forces one to think more fluidly about a lot of things and question one's own assumptions. Susan: "History will tell you that acquisition can be blind to the suffering of its victims, but that has rarely stopped anyone." Agreed. The world's definitely set up to hide the full effects of the system from anyone buying goods; Zymunt Bauman writes brilliantly about those walls in Liquid Modernity. Maybe I'm wrong, just fetishising a certain kind of limited freedom and people really do need to be persuaded somehow to throttle back their own consumption. But even getting past the sense of judgement involved, I also wonder if there's anything likely to be effective. One bit of economic orthodoxy I've absorbed: revealed preference, or "judge people by what they do, not what they say." The same people arguing for dismantling consumerism are generally wielding iphones and laptops - some of the most material-intensive things ever made, reliant on complex global trade systems and export processing zones. Somehow they exclude these things from their own internal heuristics. It would appear I don't trust people (or myself) to make effective judgements about their own consumption. Hence, again, why using the price system seems like a good idea, if we can. "they argue that crass consumerism is the key problem"
Sure, and they've every right to do so (I tend to agree with them), so why can't those who disagree just make their own argument? There's plenty of space for right-wing arguments, if those on the right wing wanted to fill it. Should it be up to those on the left to do their job for them? Actually, as you sort of say the problem isn't really a left-wing / right-wing one; crass consumerism is evident on every wing. Entirely unimpressed with this reasoning, sorry. The present system is running us into far, far too many resource constraints and pollution crises for just a pricing tweak to do the job. People participating in this blog are all members of a global elite, and need to have a degree of consciousness about that and about how libertarianism is such a convenient philosophy for people in their position. A planet where people with the resources are free to decide to pollute as much as they like so long as they pay the price that the self-same global elite has decided is fair compensation (sounding even-handed already, innit?) is one with a poor prognosis. O'Patrick: "There’s plenty of space for right-wing arguments, if those on the right wing wanted to fill it. Should it be up to those on the left to do their job for them?" No, you're quite right. I've made this more convoluted that it needs to be - I think I'm probably just realising I'm not the leftie I used to be, and I should (a) respect people who are at least doing something and (b) get stuck in to the argument if there's some points I want to make and stop whingeing from the sidelines. Different topic: two very powerful slides (can I use img tags here...?) from Duncan Clark's talk about his and and Mike Berners Lee's book The Burning Question. He's just fitted a curve to total CO2 emissions since 1850 to give a rough picture of where we've come to now. The dropoff in the first graph is then "CO2 cuts required for a 75% chance of not exceeding 2 degrees, with peak today." The second is for a 50% chance, leaving the peak until 2020. About as stark as you can get - not only in conveying the impossible-seeming turnaround required, but that various different stagings, from a long-term point of view, are not really all that different - it's rather a challenge, whichever option you pick. Incidentally, the World Bank, and the IMF, do currently seem to be two bastions of capitalism making the case for strong action on climate change. OPatrick, really interesting link, thanks. Seems like maybe there's been a shift in the US/European stranglehold on the World Bank and IMF (cf. ongoing work to democratise them) - both institutions seem to be a lot more reflexive than they were (the IMF even admitting to mistakes). I heard a World Bank bod talking last year; they've shifted to a green growth strategy, away from `sustainable development'. They suggested the green growth approach is less sweeping, possibly less ambitious in some ways, but more `demand driven' - developing countries, on the whole, don't want to hear about the degrowth that e.g. Anderson/Bows talk about in that Naomi Klein article. Steve, I suspect you are right in practice but not, I think, in principle. Anyone arguing they should be able to continue to behave as they want would need to convince me they are willing to pay the genuine price of that behaviour, not, as you say, some arbitrary 'acceptable' price. Steve Bloom: "A planet where people with the resources are free to decide to pollute as much as they like so long as they pay the price that the self-same global elite has decided is fair compensation (sounding even-handed already, innit?) is one with a poor prognosis." Agreed - and so do all those non-elite countries being asked to make sacrifices when they come to the climate negotiating table. They're no longer as easily bullied as they were in the 80s and 90s. Any global carbon pricing system is thus going to have to be fair enough to get them on board. No-one here is arguing for libertarianism - libertarians can't tolerate the kind of centralised pricing "manipulation" these sorts of mechanisms require. Also, pricing can't possibly be the only solution, can it? (Though it's effectiveness in internalising the costs of pollution is demonstrable). Many other things are required, including industrial policy and (where did I read this recently?) targeting specific carbon sources, as the EPA are doing with coal. On second thought, part of "fighting against the confusion" could involve refraining from going off-topic, on this thread. It's impossible to go off topic on the open thread. In fact, I hope to find time to reply to this suggestion. Is really what we speak. "You might have noticed that I have spent more time attacking the hypothetical positions of my opponents than actually clarifying my own position on this Issue." Hey, that's me! I'm even solipsistic enough to wonder if that link was directed at me. Apparently I'm a tone troll too. "... A recent example from Naomi Klein that kind-of captures what I mean – actually citing Tyndall Centre scientists too, arguing for degrowth as the only effective response." This attitude - and it is on view even here in this comment thread - seems to me to be profoundly counterproductive. Resource depletion isn't the most pressing problem, CO2 in the atmosphere is the problem. Our house is on fire, and some people are transfixed by the idea that if we had fewer flammable possessions the conflagration wouldn't spread so quickly. Dear god, can we please do proper triage and keep our eye on the ball? The frustration and near nihilism (another counterproductive trend which seems to be growing) amongst many concerned with AGW are expected sequellae of a misdiagnosis. Symptoms include an advocacy for a carbon tax, a predilection for decentralized renewables like rooftop solar, and an unexamined presumption that AGW must be solved by cleverly devising a truly cunning new plan using the free market system (that's the same free market system that works for carbon fuels, right?). But if the past thirty years of near fruitless effort tells us one thing, it is that the current economic/political system is NOT going to embrace renewables.World-wide atmospheric CO2 levels have never been higher. Renewables make up a miniscule fraction of our energy supply. This way madness lies. Free enterprise is not going to work with the renewable model, but public ownership does. After an initial large outlay in capital investment, there are virtually no further costs. Sunlight, wind, and tide are free. And so should be the resulting electricity. How else to coerce people away from the inertia of using fossil fuels? People and institutions in the U.S. spent $1.2 Trillion on fossil fuels in 2010. And all we are left with is a lousy tee shirt that says "CO2 is now at 400 ppm". $1.2 Trillion is a titanic amount of money. Imagine if we took 5 years worth of that spending and instead invested it in building a new national renewable energy utility. How far toward our goal of reducing CO2 emissions would we be? Anybody know the answer? And if not, ask yourself - after a decade or three of supposedly paying attention to the AGW issue, why doesn't anyone know the math on this? Pointing out the insanity of the predicament is one thing, but what to do? I personally agree with you - what we're doing is insane. Every day I'm using the self-same energy being produced by that that insanity - slowly killing our own civilisation in its own waste product pretty much exactly like bacteria in a petridish. I fairly regularly wake up in the night hit with the visceral impossibility of it - our one planet. Are we really doing this? I can really see the appeal of denying it. But that's not an argument against "markets" - it's for providing nurseries for new industries to develop. We should be doing that with carbon-free energy systems right now. (It should have been done for Africa's agri sector, rather than prising it open and then dumping massively subsidised US grain on it - utterly criminal). I think a carbon tax (combined with some large-scale, massive-push industrial policy) is the opposite of nihilism. Making a fixed, shrinking lid of carbon will force a mass of people to put everything they have into developing solutions. I would much, much rather have that option that just a bunch of bods in state institutions trying to solve the problem, which is the solution you appear to be advocating. To repeat myself, that doesn't mean NO state intervention - in fact, a truly effective carbon tax that's more than just a pathetic flannel would need strong state support behind it. Random question: can we have a wiki somewhere? I'd like to start listing carbon schemes. I keep on seeing stories about new ones in the US, I'm having trouble keeping up. It'd be great to have them in one place. We already have a wiki at http://www.azimuthproject.org/azimuth/show/HomePage . I think carbon taxation can be, and today is, counterproductive in that it motivates everyone on a government payroll to find ways to keep the rest of us burning carbon. The dividend part of Hansen's tax-and-dividend scheme would be very helpful. It transfers income from above-average emitters to below-average emitters. The half of the citizenry with below-average carbon dioxide emissions are less powerful than the civil service and the other carbon interests. I among this group wouldn't even want us continuing to emit CO2, and collectively, even if we did want that, we'd be much less effective than today's emission interests. It would be so helpful that I always ask, why not start with the dividend, enjoy the huge benefits that would follow, and leave the increase in carbon taxation for later? So propose a formula, and explain its impact on the currency of the country that implements it. A few thoughts in response, not necessarily constituting a coherent counter-argument. CO2 accumulation IS a resource depletion problem - the resource in question is the environment as a tolerably safe place to dump CO2 from combustion, and we are using it up. What's more, there is no directly comparable substitute. It is a regular theme of mine - can we wait on degrowth until the carbon problem is solved, or must we tackle them both at once. I would like to leave the end of growth for a future generation to cope with. But I could say the same about carbon combustion. We have to take a sober look at the trajectories and the immediate prospects. The window that gets us to the future without a collapse seems to be closing. I think those of us who think about these things are too pessimistic. There is no reason to believe that we can't technically support ten billion in comfort as we begin a long, slow depopulation, and thereby avoid a crash altogether. But if people continue to insist on exponential growth of some physically ill-defined econo-stuff, limits or at least absurdities appear everywhere, and not so far in the future that we can avoid them. The fact is that we have six acres of dry land per capita, and it will soon enough be five. Our vision of being "rich" tends to involve vast estates. We cannot all be rich in that sense. There is no room for that anymore. Our vision of "rich" involves vast influence. We cannot all have vast influence. We cannot all attend the most exclusive clubs. We are addicted to the growth in "production" and "demand" without ever bothering to describe what that means in practice once everybody is reasonably comfortable and there isn't room for everybody to get "rich" in the sense we understand it. I agree completely that taking our behavior collectively it makes absolutely no sense, and by itself refutes the tenets of libertarian "economism" as an ideology. But growth is one of those. Why protect it from examination while you call everything else into question? A couple of carbon / UN / mechanism design links. The Carbon Brief covers talk of a carbon trading 'toolbox' at Warsaw, including a map of existing carbon trading schemes via the IEA. A PDF by E3G looking at climate diplomacy, based on talking to diplomats. Seems to be a little generic in its conclusions, mind: top down, bottom-up both essential, national buy-in essential, everyone needs to be better at it. Uh huh. Then there's this little side-step, more related to some of the cybernetic discussions we've had here: the Orchid project. They're looking at linking human and agent systems in a number of domains, including smart grids and `citizen science'. If we're looking at a world of disparate carbon-reduction systems growing separately, there's maybe going to be some role for this kind of thing, rather than just better politics. Neither your link nor Stoat's "old" blog nor a lazy incomplete google search found Stoat's new blog. Link please (the one below does not work, for example). I'd really like to see what William Connolley has to say about the 90 companies. What a bunch of commie radicals climate scientists are.